​Olympic rower Moe Sbihi admits the pressure will be on as he lines up against the world’s best crews in the world championship final on Sunday. Concert inspired by London 2012 raises more than £300,000 to support aspiring British athletes hoping to compete at the Olympic or Paralympic Games. 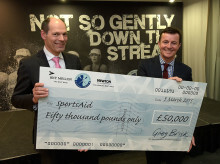 Sir Elton John CBE presents £2,000 SportsAid Award cheques to the first five athletes to benefit from the fund.